Marijus and Edvinas Šmigelskis, along with Julia Chen, visited the little know bouldering areas of Mpumalanga for two weeks. At Gold Rush, Marijus repeated "Leap of Faith" 7C, Julia sent "Wallace" 7A and Donovan Willis opened "Static Remedy" and "The Weatherman" both 7Bs. At Malelane Gorge, an excellent new area, Donovan opened "Waterboy" and Marijus opened "The Railway" both 7A. 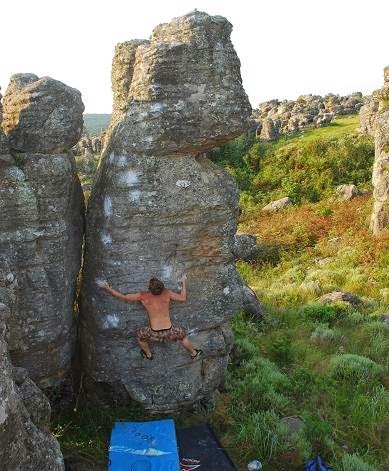 Later at Kaapsehoop, Marijus repeated "Living the Dream" 7C, and then opened "Dark Wing" 8A, an amazing high arete. Edvinas made the second ascent on his very next go and Julia sent "Smell of Victory" 7A. Back in Johannesburg at The Glade, just before heading to the airport, Julia made a second try ascent of "The Fingernail Traverse" 7A and Marijus made the 2nd repeat of "Lucky Larry's Larder of Lascivious Lesbians" 7C+.